To Your Health: Time For New Resolutions : Shots - Health News A little over half of the people we surveyed said they'll resolve to exercise more in 2012. More than a third will resolve to lose weight. And 13 percent say they'll commit to either quitting smoking or reducing how much they smoke. When the New Year's parties end, a lot of us are left with some tough promises to keep. This year, I'll lose weight. Smoking? History! And, of course, I'll start working out, too. Really, I mean it this time. So with the day for fresh starts looming, we resolved to ask Americans about their New Year's resolutions, past and future, in the latest NPR-Thomson Reuters Health Poll. First, if you're thinking about committing to improving your health in 2012, you'll have plenty of company. A little over half of the people we surveyed said they'll resolve to exercise more. More than a third will resolve to lose weight. And 13 percent say they'll commit to either quitting smoking or reducing how much they smoke. Some people have had a lot of practice with their vows to do better. A little more than a third of people have resolved to lose weight at least once in the past five years. 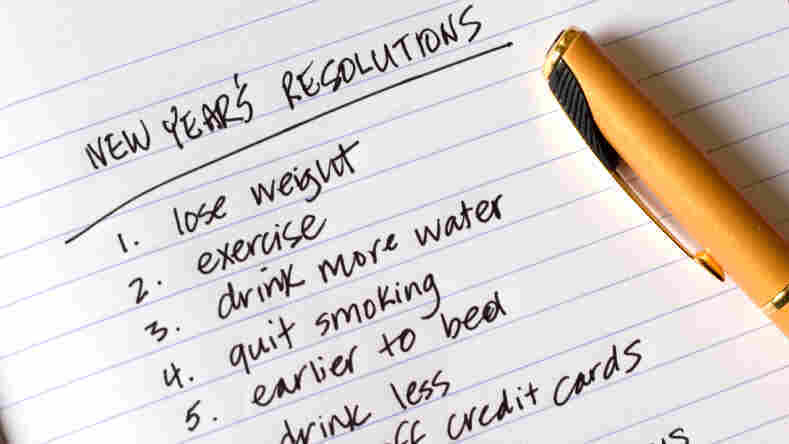 Among those who have promised themselves they'd shed a few pounds, 38 percent made that resolution five years in a row. How much did people want to lose? Almost half of people with dieting in mind wanted to drop 10 to 29 pounds. About 21 percent wanted to shed between 30 and 49 pounds. Making a resolution is the easy part. How well do people actually do? Overall, 57 percent of respondents who wanted to lose weight in the past told us they'd reached their goal. Quitting smoking is more challenging. Among people who had vowed to quit smoking at least once in the past five years, only 36 percent said they had succeeded. The telephone poll of more than 3,000 adults across the country was conducted during the first half of December. The margin for error is plus or minus 1.8 percentage points. Click here to read the questions and complete results. You can find the previous polls here, or by clicking on the NPR-Thomson Reuters Health Poll tag below. Now, we have to admit that we wondered how accurate people's reports of success on their goals might be. The folks at Practice Fusion, a supplier of electronic medical record systems for doctors' offices, gave us another way of looking at things. The company combed through a sample of real-world data from doctors' records, including the weights of more than 21,000 patients measured in 2010 and again in 2011. "There's a lot of people who are losing some weight," Jake Marcus, a data scientist at Practice Fusion, tells Shots. Overall, about 46 percent of people lost some weight. On average, it was about 7 pounds from one year to the next. Now the Practice Fusion data are from people who saw their doctors regularly, and we don't know how that lines up with respondents to our poll. After looking at our poll's findings and his own company's data, Marcus says you might not reach your ambitious New Year's health goal, but it's still worth a try. You may lose a little weight, which is better than none at all.